Yale commemorated the United States’ entry into World War I a century ago at an event in Woolsey Hall on April 6. It featured remarks by President Peter Salovey; a performance of the national anthem by the Yale Concert Band; an invocation by University Chaplain Sharon Kugler; the presentation of a memorial wreath by members of Yale’s Naval and Air Force ROTC unit (Midshipman Forrest Simpson ’19 and Cadet Alex Tymchenko ’17); the playing of “Taps,” by student trumpeters Eli Baum ’19 and Jacob Zavatone-Veth ’19; and a benediction by former Yale Chaplain the Reverend Harry B. Adams ’45W, ’51 B.D. who served in the U.S. Army Air Forces 1943-1945. 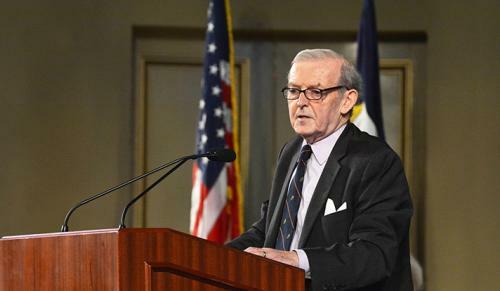 In addition, Paul Kennedy, the J. Richardson Dilworth Professor of History and Director of International Security Studies, delivered remarks at the afternoon ceremony. You can read a transcript of his remarks at YaleNews.